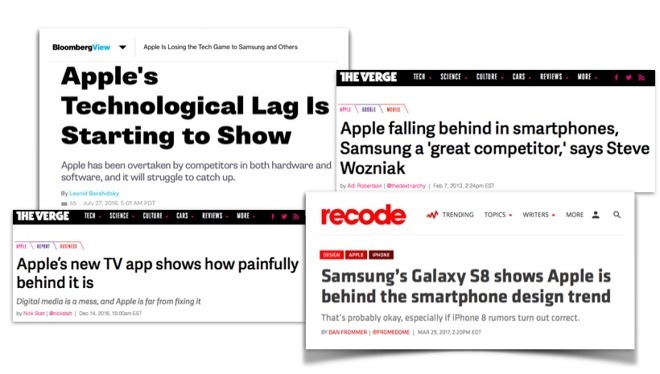 The media narrative on iPhones is almost equally as upside-down and backward as the demands among PC pundits that Apple copy Microsoft's Surface, abandon its Macs, or put mice on iPads centered around a file system. According to the world of analysts and punditry, Apple's iPhone is nearing the end of the innovation runway, and the only direction it can now take is to radically lower prices and gain market share so it can shift from being a hardware company to being a services company that rents movies like Netflix. Of course, the only reason they're even talking about Services is because Apple spoon-fed them its plans to develop expanded new Services for its vast installed base of iPhone users. After inventing the false idea that periodic unit sales are more meaningful than Apple's installed base, they're left with the totally misguided conclusion that Services is a desperate move of a crumbling empire, rather than being essentially the same thing Microsoft did when it expanded its PC business from Windows to Office. Building a platform and then building on top of it is exactly what companies are supposed to be doing, not an either-or conundrum. If you look at the incredibly myopic, constrained imaginations of today's pundits, they really aren't that different from the small minds looking through tiny portholes that were telling Apple where to sail back in 2011. 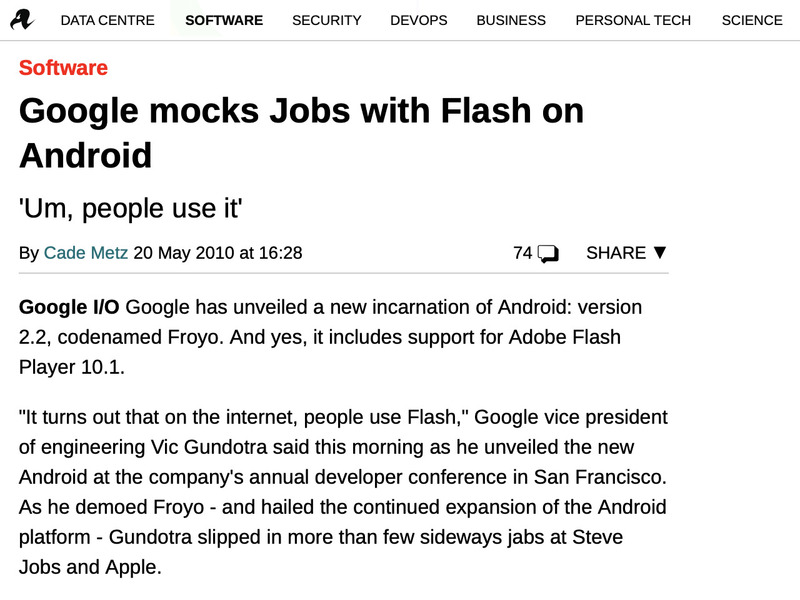 To get a sense of how visionless and ignorant punditry has been, recall that back in the days of iPad 2 and iPhone 4s, pundits were wondering why Apple hadn't adopted Adobe Flash, WebM, and NFC. But rather than Apple doing what the ignoranti observed Google doing, Apple instead continued developing support for HTML5, H.264 and Bluetooth 4. 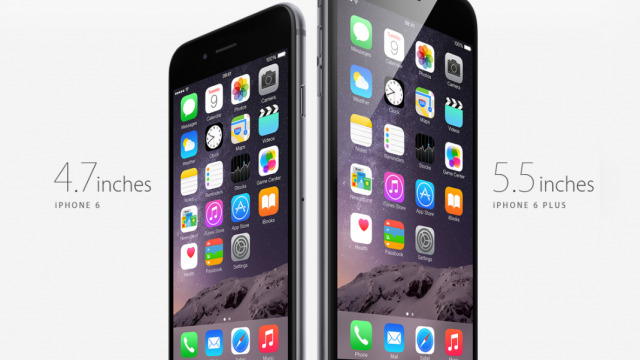 In part, Apple's support made those technologies the winners in their respective fields. That was largely because of the impact and importance of iOS to premium-hardware buyers and enterprise users, factors that were directly related to the price of iOS devices at a time when Android phones and tablets were trending toward cheapness. Pundits saw all sorts of importance in the things Google was trying to do, most of which failed. But, they saw very little hope in anything Apple was working on, despite the fact that Apple had been quite successfully setting standards and charting out the direction of the industry over the previous decade, despite being a much smaller player back then. Today, Apple is vastly larger and far more influential than it ever has been in the past. Back in 2011, there was similarly not much sense that Apple would be able to regularly develop new technologies that would keep bringing buyers back for more iPhones and iPads. 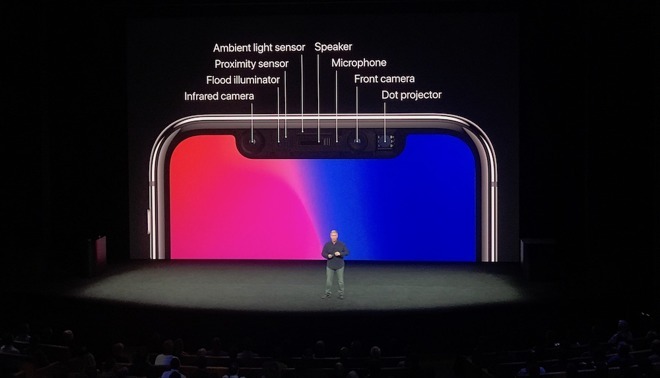 Yet Apple successfully identified technologies such as Siri, Touch ID, its 64-bit A7, advanced graphics, Apple Pay—resurrecting the fingerprint security that Android had abandoned—and most recently Face ID with Animoji and Selfie Portrait photography. iPhone consistently remained the top-selling smartphone even as The Verge and other outlets hailed every new Android as being the best smartphone ever. In parallel, concern pundits regularly admitted they had no idea how Apple might ever innovate its way out of what they imagined to be an impossible quandary of being so far behind the rest of the industry—as Kara Swisher recently did for the New York Times. That didn't stop Apple from innovating and remaining in first place globally as the largest shipper of premium phones and vastly more profitable than everyone else put together. The pace of innovation across the first decade of iOS was unprecedented, wildly faster than the incremental bumps that had been occurring in the PC industry. That innovation was driven by iPhone profits. Android was supposed to foster rapid innovation across the industry outside of Apple but largely hasn't. Instead, it has essentially served as a platform for creating knockoffs of Apple products. Multiple companies have introduced and promoted their own rival phones, tablets and other Android form factors with almost no success whatsoever. Samsung and other firms attempted to launch new media players, smartwatches, media boxes, game consoles and other devices that completely flopped on entry. Their failed ideas included smartphones with 3D displays, curved screens, side screens, and today's wildly impractical Fold. Despite waves of media fawning, these all went nowhere. In areas where Android licensees did pioneer not-quite-ready technologies such as fingerprint sensors, NFC, OLED, 4G, and large displays, they were unable to hold on to their initial flickers of interest among consumers. Their potential was quashed as soon as Apple arrived —fashionably late —and delivered a better version of what they had prematurely thrown out into the market at too high of a price, with too little thought, marginal quality, glaring security issues, and significant drawbacks in terms of size, weight, usability, and appearance. That highlights three constants: that Apple is exceptionally good at identifying technologies that can be brought to market; that it is incomparably good at successfully bringing those ideas to market; and that despite a history of this, punditry has very little sense of what could be next and who could possibly bring it into the mainstream. Today, analysts keep repeating their idea that Apple's only way forward is to retreat into low-priced devices, as if everything has already been invented. Yet that's never been the case in cars or TVs, and has not occurred even in PCs, let alone phones, tablets or watches. Apple keeps delivering hits, and each one grows larger and more significantly important than previous ones. Again, the driver of that innovation is consumer choice-driven capitalism, not the socialization of community-run factories being devoted to efficiently producing huge supplies of low-cost products, "for each according to his ability, to each according to his needs." For some reason, it's intensely popular to think that the technical progress in consumer electronics delivered by capitalism can be maintained by shifting it over to open source communism that claims it can deliver the same product at lower costs. But that's never been true. The panel of intellectuals planning the economy of the U.S.S.R. were simply unable to effectively successfully drive mass production, the same way that the intellectuals guiding the direction of Android are unable to make decisions that effectively deliver the future of mobile devices. Google's intentions to roll out initiatives like Android Pay and Android Auto and move its platform to the swipe gestures patterned after iPhone X have been problematic, despite being copied wholesale from Apple's work. Google's Allo, Duo and Tango have fared even worse over the past couple years. In the world of iOS, Apple has the ability to announce major new initiatives and features in June at WWDC, deliver them in a new iOS release in September, and then deploy its latest platform to most of its installed base by the end of the year. It's been doing this every year since 2011, with incredible success at driving new strategies that broaden and deepen its ecosystem, driving the growth of its installed base of users who increasingly select Apple's products over cheaper, commodity alternatives. However, it's not just "capitalism" delivering this, because Microsoft couldn't keep up a similar pace of software productivity for either Windows Mobile or Windows itself. It's uniquely Apple, driven to retain its position as being vastly superior to the commodity copies of its work coming out of China. It's tempting to describe Apple as "today's Microsoft" because there are some similarities in Apple being the modern day analog of the giant PC monopolist that reined over technology in the 1990s and allowed no entry for an open source desktop Linux revolution. But Apple is really acting a lot more like America of the 1960s, driven to provide a worthy alternative to the sphere of the Soviet Union. Apple isn't actively at war with Google. It's not throwing up competitive roadblocks for Samsung, or Android licensees in China. Apple is just investing in efforts to be superior so that individuals in free societies will choose to not to be tricked into the comforting illusion of communism. The only real threat that Apple actually faces is the prospect of no longer viewing any competitors as a real threat that it needs to outmaneuver with better products, of no longer being driven to build a lead in silicon or software or apps or services, and a contentment with reselling the same technology at a slight discount. When those things start to happen, Apple might create problems for itself, settling down to mediocre complacency and eventually falling behind. That's not happening yet. Perhaps that's because the tech media is working so hard to erect the image of strong competitors that simply aren't real. Apple is now competing against a media-created boogeyman that's supposedly "winning" by way of selling lots of volume while barely making any profits. The name of this boogeyman shifts between Samsung, Xiaomi, and Huawei as needed, but has to keep changing to maintain the illusion of a real player that is actually sustainable and successful. The sycophantic aggrandizement of phony rivals didn't work out well for Apple's competition in tablets or music players, and didn't ever beat Apple in the market for PCs or wearables. Across ten years of smartphones, Android has been "winning" with nothing to show but a participation trophy. Apple's been so actually successful that pundits have to wonder how long it can remain in the lead as the only company able to turn a profit. Everything has to end sometime, except for Android winning, of course. 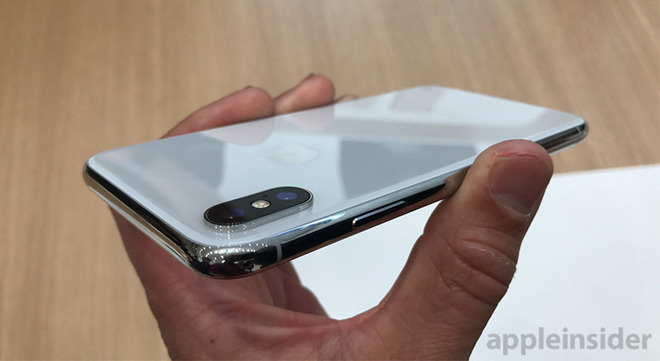 After solidly agreeing with each other for most of the last year that Apple was doomed in its efforts to sell iPhone X, supposedly because its premium price of $999 was something "some" couldn't afford, they're now lining up like lemmings to parrot the idea that experimental foldable phones are somehow going to attract sustainable attention at prices from $2000 to over $2600, from vendors who already struggle to sell their existing Androids at an average of $250 or less. With such laughably false coverage, the global leader in premium sales and profitability gets to look like a struggling underdog.